Summer is upon us. The temperature has risen and Fresno’s beautiful spring days have long disappeared, replaced with a type of heat that pushes us poolside and towards the barbecue where locals know food can be cooked without contributing to the oppressive heat. We’ve mastered other ways of dealing with summer. We know where the best iced tea can be found, we know the location of every ice cream and yogurt shop in the Greater Fresno area, and we know that the summer heat can’t reach you inside a cool movie theater or dark restaurant. We also eat salads. Lots of them. With that in mind, my husband, a colleague and I found ourselves at Campagnia - Fresno, CA during lunchtime on one of the hot days that Fresnans are so familiar with. Earlier in the week, we learned the restaurant was offering a special farm-to-fork summer salad menu. This new addition, combined with Campagnia’s impeccable service, refreshing iced tea (our waiter noted it was brewed with Peet’s tropical tea) and shaded patio made the north Fresno establishment an easy choice. On the day we arrived, bright green succulents in shiny white vases sat on each patio table. We happily took our waiter’s suggestion that we try the fresh mozzarella and sun-dried tomato bruschetta. When it came, we were not disappointed. The thick, toasted bread and pecorino cheese perfectly matched the sweet and spicy sun-dried tomatoes and balsamic syrup. 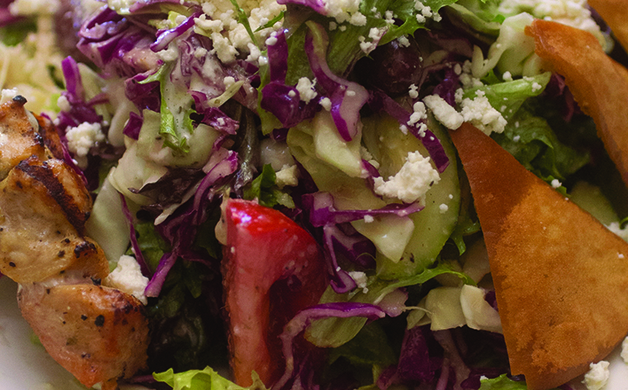 We tried all three salads on the new menu. 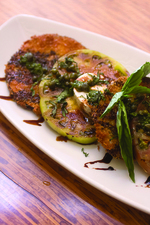 A favorite was the Crisp Eggplant Caprese Salad, made of a medley of heirloom tomatoes, fresh mozzarella and crisp-fried eggplant with pesto and capers, all drizzled in a sweet balsamic. 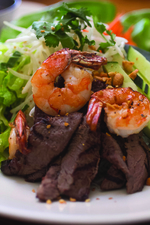 The Southeast Asian Grilled Beef and Shrimp Salad had fresh herbs, bean sprouts, pickled carrots and cucumber and came with a peanut sauce and a lemon grass sauce. The Mediterranean Chicken Skewers Salad sat on a bed of romaine mixed with cucumbers, tomatoes, Kalamata olives and feta cheese and was topped with a red wine vinaigrette and lemon aioli. Each salad was distinct and delicious. Summer or not, Campagnia’s creative menu and inviting, upscale bistro atmosphere make it a Fresno must-try — and must-try again. 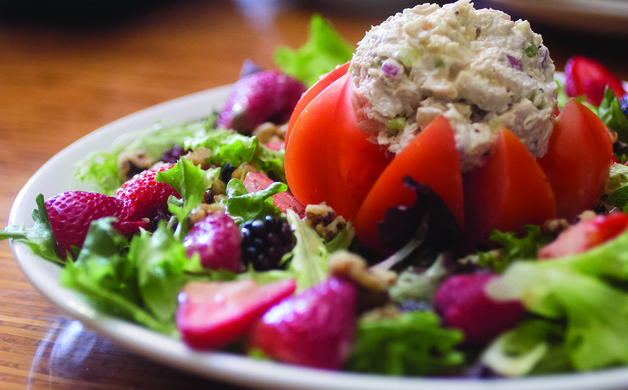 The Chicken and Walnut-Stuffed Tomato Salad is a regular menu item but no less impressive — a bright red tomato stuffed with chicken salad on a bed of field greens with fresh berries and walnuts and topped with a honey-Dijon dressing. 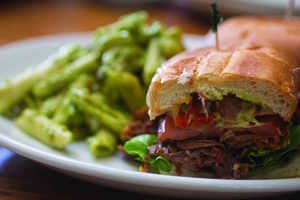 Campagnia has extensive menu options during both lunch and dinner — a fact our waiter wanted to make clear when he brought out their cheese steak sandwich, which features pepper jack cheese, sautéed onions and peppers on a country French roll with spicy mayonnaise. Even the salad-goers couldn’t resist a taste. Campagnia is located at 1185 E. Champlain Drive in Fresno. To make a reservation, call (559) 433-3300 or visit campagnia.net. 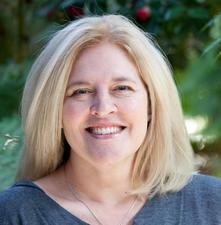 Written by Amy Guerra, a criminal defense attorney practicing in Fresno. 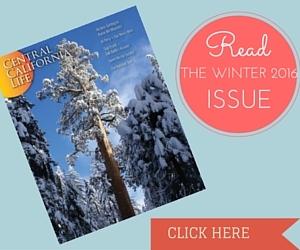 She has written for several publications throughout California and enjoys writing about the law, food, travel and all things Fresno.